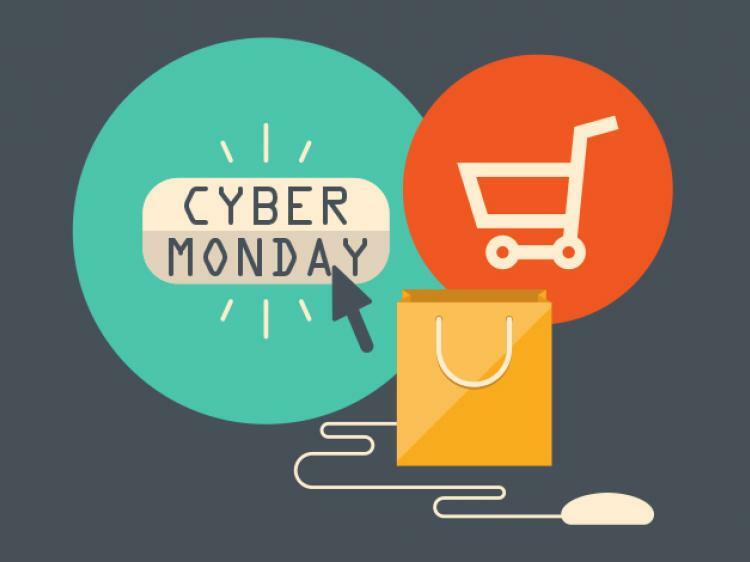 Cyber Monday is Quickly Approaching is Your Network Ready? Cyber Monday crushed it, again. Adobe reported that Cyber Monday eCommerce sales grew 16% year-over-year to $2.29 billion. Adobe also said that 18.3% of sales came from mobile devices, an increase of 80% year-over-year. ComScore reported that Cyber Monday reached $1.73 billion in desktop online spending, up 18% from 2012. IBM said Cyber Monday was the biggest online shopping day in history, with a 20.6% increase in online sales. 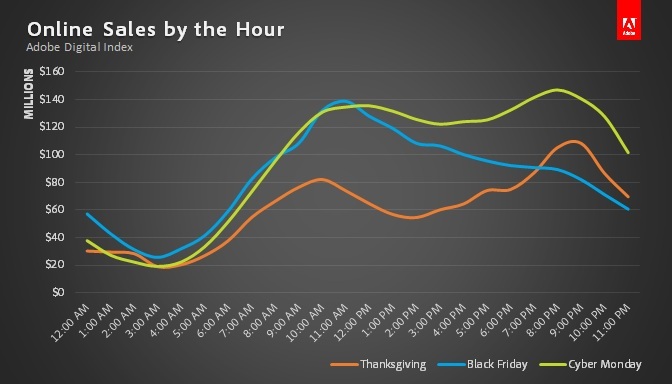 The chart above shows Cyber Monday sales dramatically increasing around 9 am on Monday and holding steady throughout the entire work day. With more and more of your employees doing their shopping online, it has become a cyber security issue for businesses making sure their networks are secure, managing bandwidth and protecting their employee from identity theft . CyBlock Web Security products will help you manage all of this from an easy to use single console. More information about CyBlock Web Security Products. Posted in CyBlock, CyBlock Appliance, CyBlock Cloud, CyBlock Software, Security Threats, Tech Tips, Wave News | Comments Off on Cyber Monday is Quickly Approaching is Your Network Ready? In Release 9.1.2, we are excited to provide our customers with CyBlock Hybrid, a new deployment option that extends Web filtering and monitoring to your off-premises employees. It combines your existing CyBlock installation with a CyBlock Cloud service. The enhancements are described below. A CyBlock Cloud account will be created for you. The Settings – Hybrid page allows you to pair your existing installation of CyBlock with your cloud account by entering an access key. After pairing occurs, the User Management – Authentication – Rules tab will display a Cloud entry with the same authentication type as the Default entry. The ability to manually sync configuration changes with your cloud account is available on the Settings – Hybrid page. You can also temporarily stop all communication between your CyBlock installation and cloud account, reestablish communication, and delete the pairing. Application Controls. Additional YouTube video ID formats are now accepted, and previous formats have been updated. An Anonymous IDs option has been added to the Settings – Reports – Options page to allow anonymous IDs in reports. With this option selected, the Anonymous IDs field on the Create Report page will be available to enable anonymous IDs in the report you are running. Wavecrest Computing, the makers of CyBlock, have just announced the availability of the Hybrid option for CyBlock. For organizations that are composed of a main office, branch offices, and remote and mobile users, there is a certain need to safeguard all networks and employees in the organization. Organizations want to apply the same Acceptable Use Policy (AUP), which is being enforced for on-premises employees, to remote employees. Along with an on-premises installation of CyBlock Software or CyBlock Appliance, companies can also secure remote offices and mobile users using a Hybrid deployment of CyBlock. 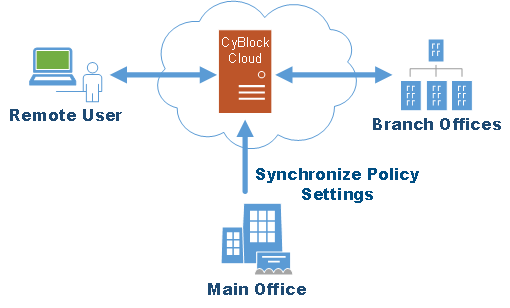 CyBlock Hybrid offers a flexible Web security solution that combines your on-premises CyBlock installation with a CyBlock Cloud service. You can manage the policies for your on-premises and off-premises employees from a single interface. Using CyBlock Cloud, the Hybrid deployment secures remote and mobile users so there is no need to route traffic back to the main office. You can free up local server bandwidth and be assured that Web filtering for these users is occurring in the cloud. Wavecrest Computing has been the recognized leader in Web security and Web-usage forensic solutions for over 17 years. Our scalable filtering and forensic reporting analysis products are designed to enable organizations to successfully address Internet abuse, legal liability, workforce productivity, and Web security threats. Wavecrest Computing’s client list includes well-known corporations such as Edward Jones, General Electric, Lockheed Martin, Blue Cross Blue Shield, MillerCoors, Rolex, Siemens, and others. You are currently browsing the Wavecrest Blog blog archives for November, 2014.